The Wheeler Print Shop is a student run program that not only benefits the students by offering real world experience but it also allows the students to help our community. As an extension of the Graphic Design course students can offer both design work and printing services. 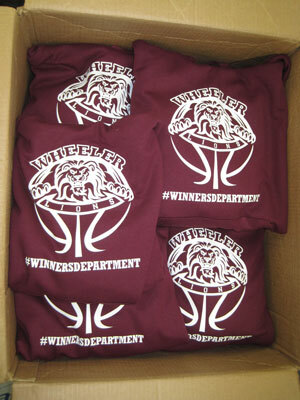 We can design and print custom apparel, documents and vinyl signage. Please see our order form for further printing details. All order forms should be sent to Mrs. Noel Devine (email) for a quote. Currently, we are only accepting orders from municipal entities. But please contact Mrs. Devine with any questions.